Tomography is an imaging technique that estimates the cross-sectional interior structure of objects through the use of an external, penetrating signal. In this research, we use Electrical Impedance Tomography (EIT), which uses surface electrodes and high frequency alternating current (AC) to measure internal electrical impedance. By placing many electrodes around an object, it is possible to reconstruct the internal impedance distribution and infer the interior structure. EIT is safe for long-term continuous operation (low voltage, no ionizing radiation), non-invasive to the wearer (rests on skin without the need for e.g., conductive gel) and can be made inexpensive (~$50). For these reasons, we recently adapted the technology for use in a gesture-sensing smartwatch called Tomo. Tomo provided a glimpse into the applicability of EIT for input sensing. To further expand the feasibility of this promising technique, we sought to explore technical improvements to low-cost, worn, EIT sensing. The most obvious parameter that can be varied is the number of electrodes. Intuitively, more electrodes will produce a denser mesh of sensed paths (Figure 1), which should yield a superior reconstructed image. In addition to varying the number of electrodes, EIT systems can also choose between two very different types of EIT sensing. The first method is “two-pole” sensing, in which impedance measurements are captured from each pair of skin electrodes – one acting as an emitter and the other as a receiver. This method is affected by skin impedance and so larger electrodes are typically used for greater contact area with the skin, precluding dense electrode arrays. However, this approach is popular due to its technical simplicity. Alternatively, EIT systems can use a more sophisticated “four-pole” scheme, which excites an adjacent pair of electrodes with an AC signal and measures the voltage between another pair of electrodes (Figure 5). This process is repeated for all possible emission and measurement pairs. This differential measurement approach makes four-pole sensing less sensitive to contact conditions at the skin. We built our EIT system such that it could toggle between two- and four-pole sensing schemes, as well as 8-, 16- and 32-electrode configurations (i.e., six EIT configurations in total). We used this setup as a vehicle for experimentation, allowing different EIT schemes to be readily and directly compared. As we will discuss, we used a variety of controlled baselines to compare and discuss performance tradeoffs and accuracy gains. We also replicated the user study in Tomo to see how hand gesture recognition accuracy varies across our sensing conditions. Zhang, Y., Xiao, R., and Harrison, C. 2016. 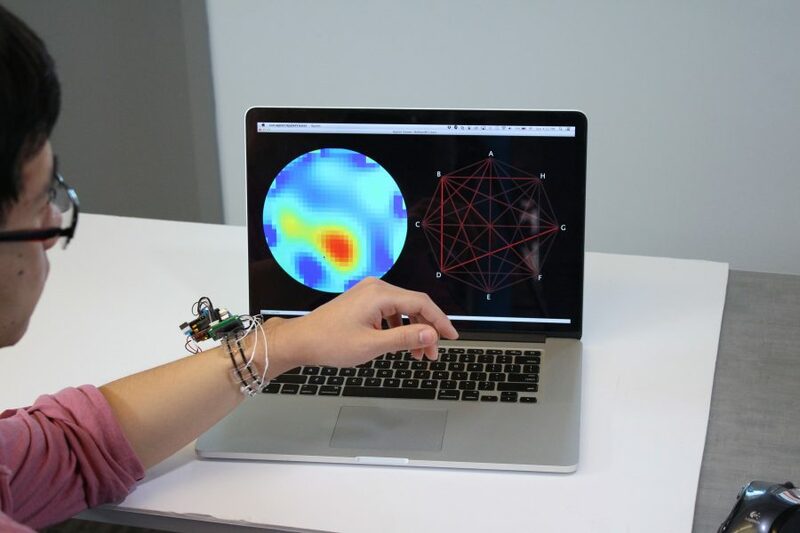 Advancing Hand Gesture Recognition with High Resolution Electrical Impedance Tomography. In Proceedings of the 29th Annual ACM Symposium on User interface Software and Technology (Tokyo, Japan, October 16 – 19, 2016). UIST ’16. ACM, New York, NY.